Big Rigs 'n Lil' Cookies: Spring Please!!! Today is a photo update for you of what is going on outside of the kitchen! The ladies are anxiously awaiting spring, however they have finally learned to tolerate the snow. Some fresh green grass would make them so happy, but until then produce from the grocery store will do. This snow pile is a reminder to save until July when I am tempted to complain about the heat! To help break up the winter blahs, we went on a road trip yesterday. We normally stay pretty local, and a road trip means crossing the border and going into Minnesota. This time we went to Wisconsin Dells and Madison. 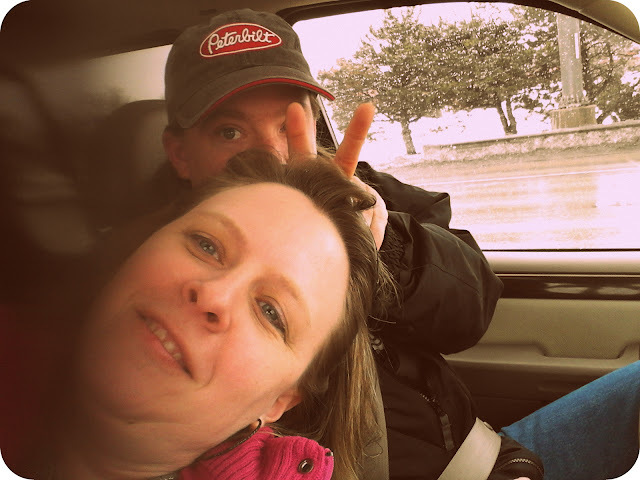 Question from Truckin' Man: Does everyone else share dorky pictures? We shopped at Tanger Outlet Mall where I found these adorable rooster measuring spoons! One of the awesome things about Wisconsin is cheese stores! Coming home, I found a Carr Valley store, was in one of the towns we were traveling through. Yeay!!! Have a great week everyone! I'll be back with a new recipe soon! Now that is a pile of snow! Tell Truckin' Man, YES, we do! LOL Thank you for sharing with the Clever Chicks Blog Hop this week!